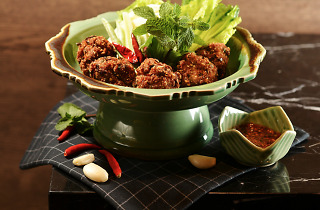 Nara Thai Cuisine is a restaurant opened by female entrepreneurs in Thailand that has earned many accolades in Bangkok. Keeping the girl power theme alive, Apinara, its new Hong Kong branch, has just been launched by homegrown female restaurateur Pearl Shek, who’s also behind Central casual eatery, Isono. But what difference does a woman’s touch make to the dishes here? 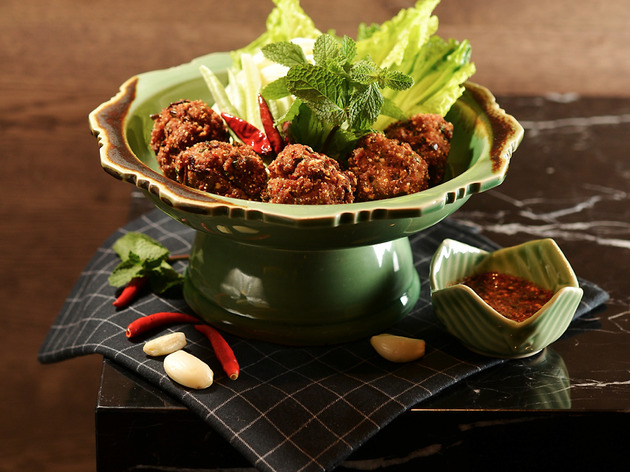 We’re seated in the restaurant, which is adorned with a few Thai motifs like banana leaf ceiling fans, and then we kick off with the spicy northeastern pork balls ($98), where crispy fried spheres of meat are to be eaten wrapped with lettuce. We like the hot ‘n’ spicy sour sauce that accompanies this dish, but the leaves are too rigid and small, leaving much of the husky exterior of the pork exposed. At times, the texture of the balls is so rough, it’s like licking sandpaper. 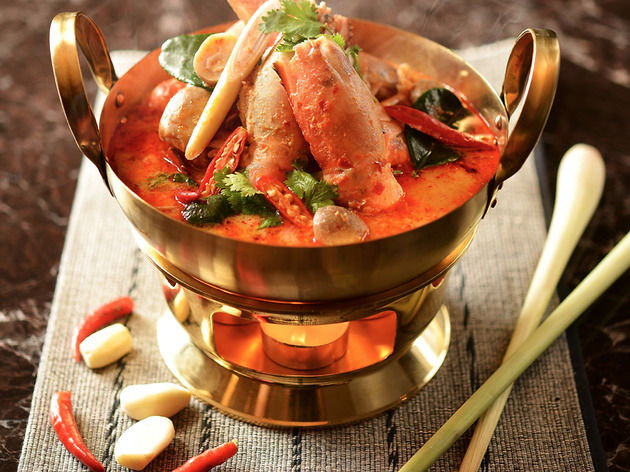 Luckily, though, our dry palates are satiated by the prawn tom yum kung ($118). Served on a heated wok, this soup is a fantastic balance of sweet, sour and hot spice. 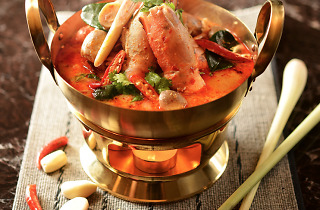 The longer the soup simmers with the prawns, the better the briny seafood flavours infuse with the broth. 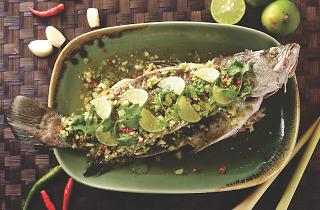 The steamed sea bass in spicy lime sauce ($238) is not so great, however. 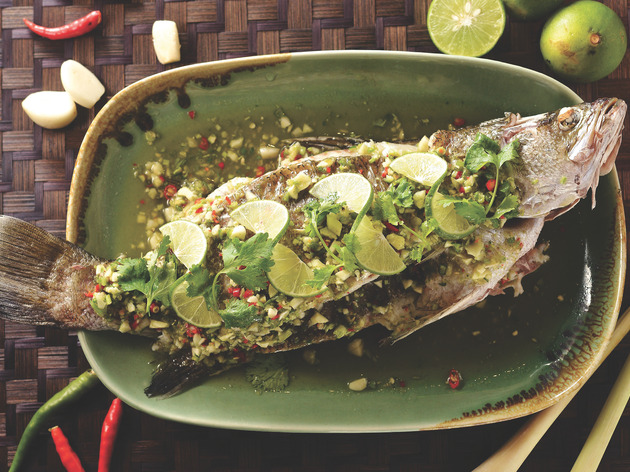 Where the fish is meaty and fresh, the lime slices on top are merely garnish as there’s barely any citrus flavours in the spicy sauce. We do end the meal on a high note when we opt for the Thai tea pancake ($78). The triple-stacked dessert is infused with tea and the ice cream with its strong Ceylon tealeaf flavours makes the dish. We like the fierce spice levels in the savoury dishes at Apinara and some dishes shine, so well done to the staff behind the magic. But some creations need a little more balancing yet. It’s a decent Thai experience here but a little more quality control in execution is needed for this branch to live up to the original over in Bangkok.